Chronicles of wondrous European journeys. The "Creation of Adam" from the central panel of Michelangelo's Sistine Ceiling. Photo: WikiMedia.org. Welcome to the December ArtSmart Roundtable. What is the ArtSmart Roundtable you ask? It's a company of travel bloggers who share their passion for art while traveling around the world, and on the first Monday of each month, we publish a themed series of our discoveries in composition, medium or experience. 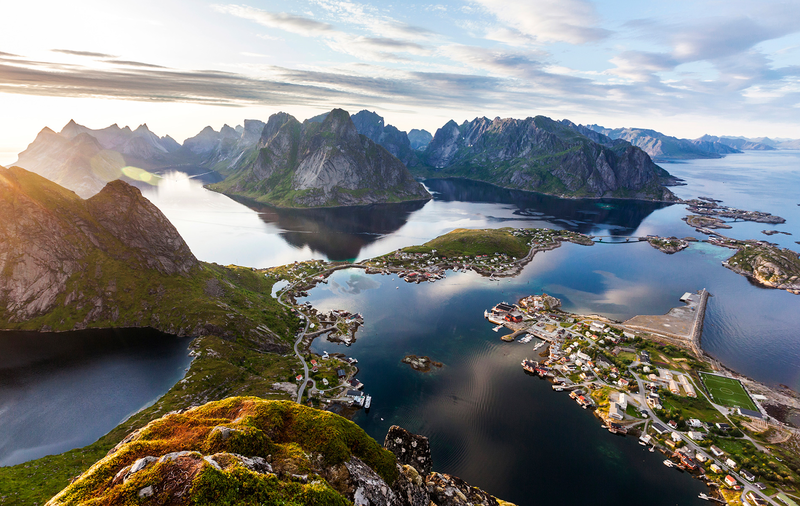 December is the month we share our absolute favorite travel + art experience. 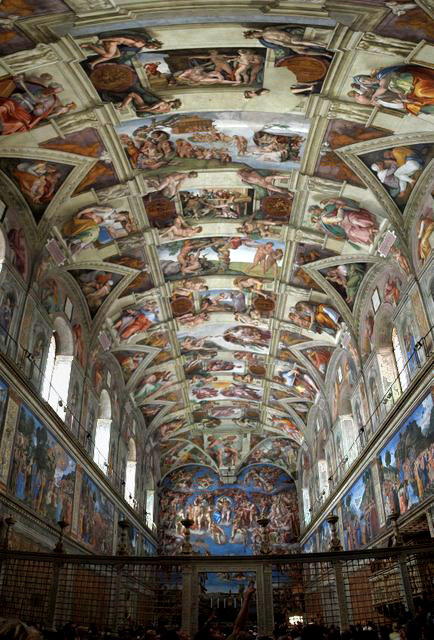 The Sistine Chapel in the Vatican in Rome and Michelangelo's magnificent ceiling. Photo: Patrick Landy via WikiMedia.org. Throughout my travels, I seek out and experience art in as many ways possible whether it's through museums, cathedrals, architecture, castles—among others, art is always at the top of my itinerary. And I have been to some of the world's greatest museums including the Louvre, Uffizi and Accademia but the experience that moved me so profoundly and like no other was my very first trip to the Vatican—the Sistine Chapel and Vatican Museum—an unforgettable experience that I will cherish for the rest of my life. Rather than a study in the subject matter, this post is experiential—a sensorial moment when emotions transport you to a state of euphoria. I hope you seek out art discoveries in your travels and if not, may this post be an inspiration. Also, be sure to scroll to the end of this feature for my colleagues' contributions to the December ArtSmart Roundtable. 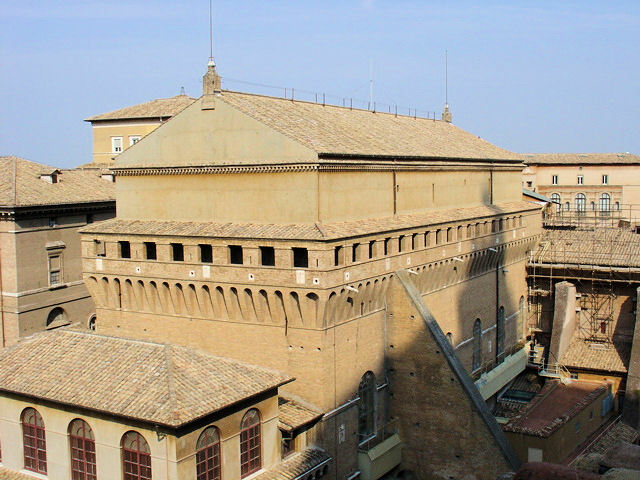 Inside this medieval facade lies one of Michelangelo's greatest contributions to the world—the Sistine Chapel at the Vatican in Rome. Photo: EuroTravelogue™. Unauthorized use is prohibited. Ever since my very first Art History course in college when I was introduced intimately to Michelangelo's Sistine ceiling and the Stanze di Raphaello or Raphael Rooms, wanderlust ignited and my imagination ablaze with thoughts of experiencing these and all the magnificent works of art I have studied. At that time, a trip to Europe was not in the cards so to speak, but I would forever hang on to the dream of one day visiting in person and see it all with my own eyes. Further fueling my wanderlust and fresh from her trip to Rome, my professor, still exuberant from her travels, enthusiastically and most emphatically introduced us to the wonder of Michelangelo's Sistine Chapel and Raphael's "School of Athens"—among many other works she encountered throughout her tour of Italy. From that moment on, I was captivated, I was hooked and my desire escalated to state of insatiability until finally in 2005, my dreams came true! Standing in the middle of the Sistine Chapel looking back at where we entered. Technically, these are the north and east walls of the chapel. Photo: WikiMedia.org. On the day we arrived in Rome, we were scheduled to tour St. Peter's Basilica followed by a visit to the Vatican Museum. When we arrived at the threshold of the Sistine Chapel, I just couldn't believe I was standing in the very same spot where Michelangelo stood 500 years ago, where he masterfully decorated the ceiling with his incomparable series of frescoes recounting the story of "Genesis" among many other prominent religious figures and moments in biblical history. Gazing up and all-around, I was so overwhelmed with humility and awe that I started to cry at the glorious majesty spread out before my eyes—reveling in every moment with intermittent flashbacks to my college days flooding my imagination, and wishing all of this would never end. It was an experience I would never forget. Close up of the Sistine Ceiling showing "Creation." Photo: WikiMedia.org. If you want a deeper dive into the panels and subjects of the Sistine Chapel, read more in my overview of the Sistine. 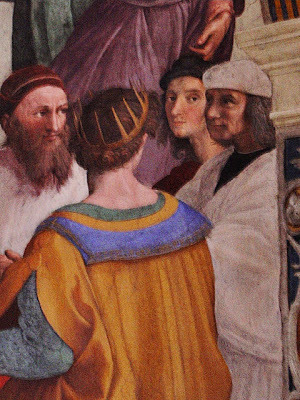 Raphael's "School of Athens" decorates one of four walls of the Stanza della Segnatura. Photo: WikiMedia.org. After I caught my breath from my visit to the Sistine Chapel, we were off to explore the rest of the museum. Heart-pounding anticipation building once again on our approach to the Stanze di Raphaello or Raphael Rooms where I was about to get up close and personal with the "School of Athens," finally. Inside these rooms, specifically the Stanza della Segnatura, which at one time was intended to be one of four rooms in a suite of apartments intended for Pope Julius II, I was about to see the magnificent “School of Athens” fresco that depicts the grandest gathering of the most brilliant minds in history, some of which are personified by renowned Renaissance masters of the day. Yes, the room was a beehive of tourists, but the fresco's main subjects are elevated enough to allow for unhindered views from across the room, you can stand back and take it all in—examine every square foot of this colossal fresco stretching 25 feet wide and 17 feet tall. 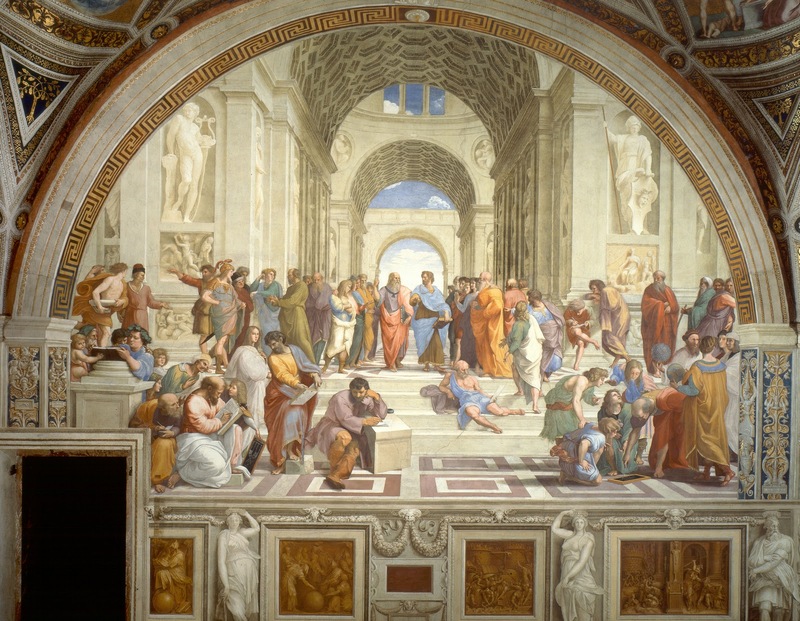 Its very composition astonishes me to this day for in this fresco, Raphael depicts brilliantly the school of philosophy and the love of higher learning. What inspiring concepts in and of themselves. In addition to seeing Plato and Aristotle, our central leading men of this scholarly gathering, I wanted to see the self portrait of Raphael himself, visible in the lower right corner of the painting. Have you seen him? 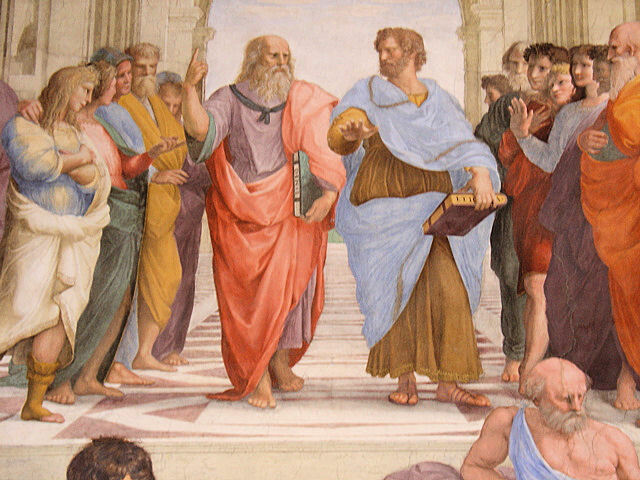 Our leading men: Plato on the left and Aristotle on the right, each expressing their worldly views from above or the here and now. Photo: EuroTravelogue™. Unauthorized use is prohibited. The master Raphael peers out at all of us who view his renowned masterpiece. Photo: EuroTravelogue™. Unauthorized use is prohibited. For more on Raphael's "School of Athens," check out the study I wrote earlier this year that explains the composition in more detail. As you can see, these two works are very close to my heart and responsible for my love of art! Have you had similar moments of euphoria when experiencing art in your travels? Please tell me about them—inspire me with your tales of discovery! Keeper of the Castle via Christina at DaydreamTourist.com. How Ireland Brought Me to the Basilica of San Clemente via Erin at ASenseOfPlace.com. The Staffordshire Potteries via Lesley at CultureTripper.com. Fresco Feelings in Milan! via Leslie at CGTravelsBlog.com. Outstanding post, Jeff. 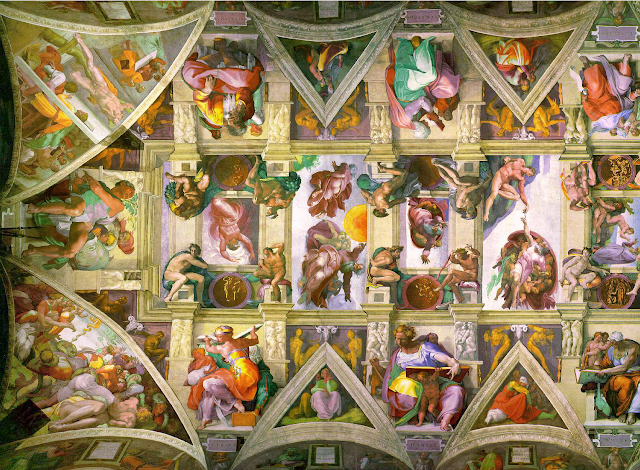 Michelangelo's images are so embedded in Western psyche, we have all been influenced by the Sistine Chapel whether we have visited in person or not. I haven't been back since the frescoes were cleaned; it's 'clearly' time for a repeat visit! Thank you so much my friend for your compliments. Coming from you, I am honored! Now, you must get back to see the Sistine STAT and I must tag along of course! Thanks for stopping by and sharing your thoughts! Loved this post! As I read I could feel your enthusiasm which made me feel like I was actually there (kind of sort of!). I've never been but can really see how one could be overwhelmed by just the number of artworks! I'll remember this post when I am actually viewing them for myself. Hi there Debbie and thank you so much for your kind words! I really enjoyed my first visit immensely! Since then, I've been back a few times and the feelings are the same! It's something you must experience in person so I urge you to move a visit to the top of your bucket list. Thx for stopping by and sharing your thoughts. Much appreciated my friend. At first, the Creation of Man photo looked "off" to me, and the I realized it was the cleaned version. I think I prefer the brighter colors of the cleaned version than the "original". I had the very same feeling you had at the Sistine Chapel in Hagia Sophia. Just standing in awe. I love that feeling. When I saw the image for newly-cleaned "Creation of Adam," I just had to grab it from WikiPedia. As you know, photos are not allowed inside the chapel so I was at the mercy of the Internet for images...and during my search, that one popped off the page. Quite Stunning as is the entire left view of the ceiling. The colors are remarkable! Thank you so much for stopping by and sharing your experience at Hagia Sophia...that incredible basilica is high on my list! This brings me back to the day I visited the Vatican - it was actually exhausting being so moved and in awe of everything there. You've highlighted two of my very favorite works of all time...and made me wish that I'd looked closer to see if anyone else staring up at the Sistine Chapel ceiling that day had tears of joy in their eyes, beaming with appreciation - that's such a beautiful image. HI there Leslie and thanks so much for your comments! I bet you would have found many a teary eye in the Sistine! I too, have heard about limiting the numbers allowed in the Sistine however, if they choose to do so, I just hope it's still accessible to all who desire to behold its magnificence! I am sure they will come up with something to appease everyone...I hope. Thx so much for stopping by and sharing your thoughts! 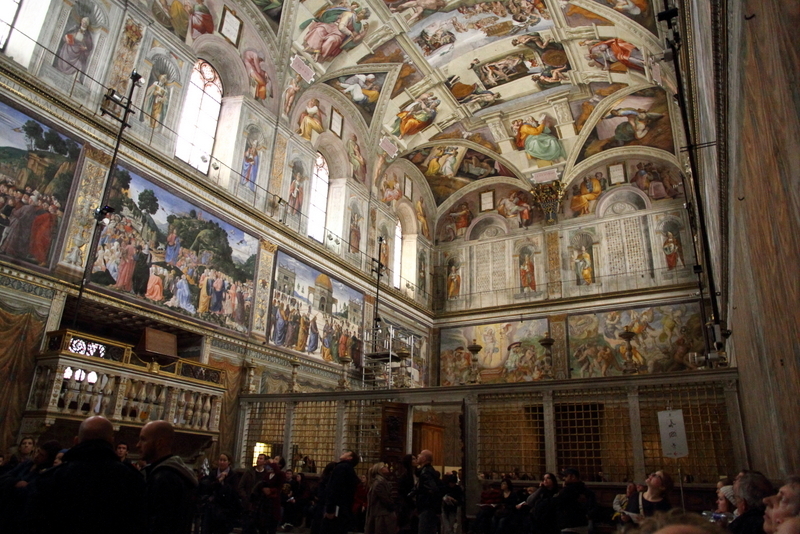 I have pics of the Creation if you like :) Loved the Sistine Chapel too. The artwork is unbelievably amazing! Hi there Aleah and thanks so much for stopping by and for your kind offer of pics. I just may take you up on that the next time I write about the Sistine...one of my all-time FAVs as well my friend! Thx again. Thank you for stopping by and sharing your thoughts! 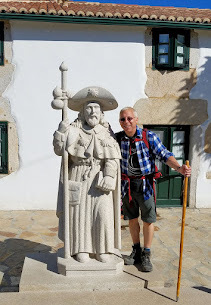 Welcome to EuroTravelogue.com – My online travel journal chronicling wondrous journeys through Europe; and the roads and rivers along the way. New discoveries await as well as the opportunity to get re-acquainted with those places you already love. Savor the journey as well as the destination! 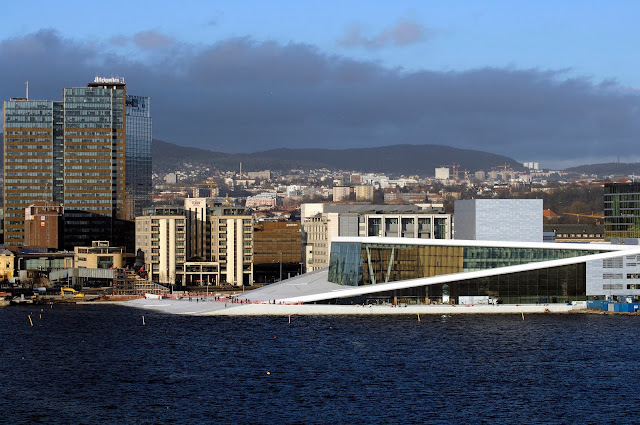 © EuroTravelogue.com. All rights reserved.